Disneyland is "the biggest regional theme park in the country." But, it's also a fantastic park for all Disney fans! It can be a great short stop on a longer California trip or a destination in it's own. Disneyland is not just for locals anymore and this book will help everyone have a better trip! Just like the comparison of Disneyland to Walt Disney World, this book is much smaller. In fact, it's even smaller than the Unofficial Guide to Walt Disney World for Kids. But, that makes perfect sense, as there are only 2 theme parks to cover - Disneyland Park and Disney's California Adventure. There is a small section on Universal Studios Hollywood, but even that doesn't need much room! Disneyland is so different from Walt Disney World in that there are only 3 on-sight resorts, all of which are considered (and priced) deluxe, but there are a lot of Good Neighbor hotels in walking distance - many a closer walk to the main entrance of Disneyland than Paradise Pier, which is located at the far end of Disney's California Adventure. In Part 1 - Planning Before You Leave Home, there are pages of charts comparing the local hotels, but Disneyland and non-Disney property. They have an overview map, charts with quality ratings, costs, and even contact for each hotel. With so many options in the Anaheim area, it can be incredibly overwhelming to decide on an off property hotel, especially for us WDW on-property people, but this section of the book is a lifesaver! Just as they do with the WDW books, each year, the Unofficial Guide Team do request for visitors to complete surveys on their stays. They take traveler ratings very seriously in addition with their checking on the hotels and looking at hotel rooms as frequently as possible. A section I love (again, valid in all three books) is the "Small-Child Fright-Potential Chart." Relating specifically to the 3-7 year old crowd, each area of the parks have the areas highlighted that may scare children in this age range. While there are less interjections and rumors found in this book, there are "Touring Tips" Had I read the touring tip on Roger Rabbit's Car Toon Spin, with it's 3 star rating and long waits, I would have known that this attraction stays busy all day and to add it to the early morning must-do list! Of course, reading it, I realize it's a spinner ride that can be more sickening than the Tea Cups and it's probably better we didn't ride! Just as with this particular attraction, all attractions and restaurants are written about in detail. I now know what I missed and what I'll have to check out on my next trip to the Disneyland Resort! I often plan trips around Dining Reservations (who doesn't?) and this book even helps that - with a chart on the Best Snacks and Disneyland Resort. I did try the Coconut macaroon shaped like the Matterhorn from the Holly Holiday Bakery and the pretzels stuff with jalapeno cheese (phenomenal) but I sadly missed the Panko-crusted long beans when I visited Trader Sam's at Disneyland Hotel. Hopefully they'll bring those to the East Coast when Trader Sam's opens up at the Polynesian Village... sometime in the future. 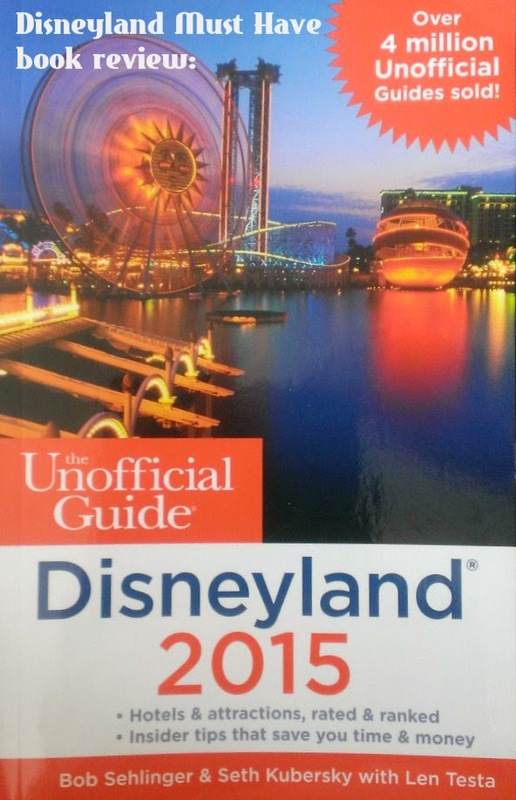 I had the 2014 Unofficial Guide to Disneyland on my trip, but wish I had gone through even more closely to learn about everything that we visited. I think I may have been overwhelmed simply trying to visit a new place, but now I'm more excited about the attractions, restaurants, and snacks that I missed. These books are really fantastic and I can't recommend them enough. While I can't recommend them enough, I CAN give one away. One reader will win a copy of THEIR CHOICE of Unofficial Guides - either Walt Disney World, Walt Disney World with Kids, or Disneyland 2015. I'd like to win the Walt Disney World guide! I would love the Disneyland guide! I wish you luck!! I hope you'll consider using a Guru agent to help you plan! Good luck!! You might also like the WDW with Kids, too :) I'd love to help you plan for real next time you all go!! I would love to win the WDW with Kids guide. We have a trip coming up in November and I know there is a lot that is new! I really want to go back to DLR! I'd like the WDW guide! I would pick the Disneyland guide! The WDW guide would be great. I love your blog Jenn, So informative and creative!!! I would definitely choose Disneyland - the planning is certainly a little more foreign to me! I'd like to take my kids to WDW so I'd love that guide. WDW in December so this would be perfect thanks.